yes, this IS a nursing top! it is a variation of the overlap nursing top that i love so much. but you don't have to make it with a nursing access--i'll explain how to make it with and without. start with a t-shirt pattern and make one copy of the front piece. you will be making more pattern copies as you go, so keep your pattern paper handy. (NOTE--copy only the pattern--not the seam allowances! you add those back on when you finish making your pattern). on this first copy, you are going to draw your empire style line. measure down the front of your body from your neck to a point directly between your breasts. mark this point on the pattern center front line. also place a mark on the side seam about 4 inches down from the underarm point. join these two marks with a gentle curve. 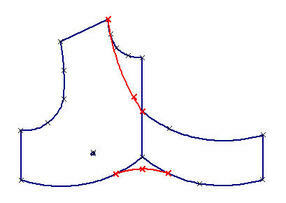 the exact shape of your curve depends on your bust size--the larger your bust cup, the more your line should curve. 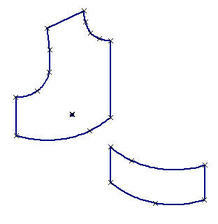 the little mark in the middle of this pattern piece indicates the bust point. (click on any image to see an enlargement). cut the pattern apart along this line and set aside the top half for now. make a copy of the lower pattern. 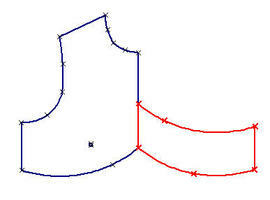 if you are making a non-nursing top, save the original--it will be your lower bodice pattern. 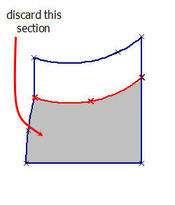 draw a line parallel to the top edge, 3-4 inches down, and cut this section off. this will be the part that twists. discard the rest of this copy. now--pay close attention. :) take the piece you just cut off and flip it from left to right. join it to the upper pattern piece along the center front line so that the bottom edges meet. all you have to do now is create a neckline and smooth out the bottom edge. just draw a smooth line from the shoulder to the center front where it meets the tie, and make the bottom edge curvy at the center. 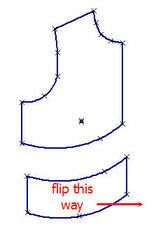 make another copy of the original front pattern and place a mark in the same place as your first center front mark. now draw a gentle curve from the underarm to this point. the lower portion is your underlay. discard the upper section. make the back neckline as desired--i've left it as a jewel neck on these patterns, but i've made tops with v-neck and with scoop neck and like both of these very much. when you have finished all your pattern work, you should have an upper bodice piece, a lower bodice piece, a bodice back, and sleeves (if desired). add seam allowances and hem allowances (if making the nursing version, do not add anything to the top edge of the underlay--mark your pattern so you'll remember!). to make your top, you will need some stretch fabric, matching thread, and for the nursing version you'll need some 1/4" elastic. 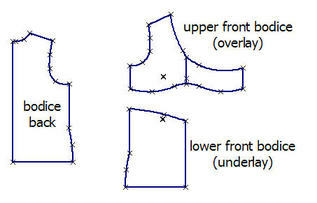 for both the nursing and non-nursing versions, cut two upper front bodices, one lower front bodice on the fold, one back bodice on the fold and two sleeves (if desired). 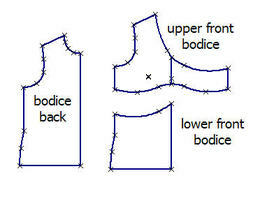 sew the upper bodice pieces to the back piece at the shoulders. finish the neck edge all the way to the end of the ties. wrap the ties around each other ONCE so they twist together at the center. the right tie will now be pointing to the right, and the left tie will now be pointing to the left. sew the raw edges of the ties to the bottom edge of the upper bodice. 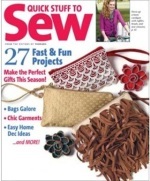 there will be a small section at the center that you cannot sew because of the twist. for the non-nursing version: gather the ends of the ties as desired, and baste to hold. sew the upper bodice to the lower bodice--again, the twist will prevent you from sewing all the way to the center. set in sleeves (or finish armholes). close side seams, catching the ends of the ties in the seam. hem. for the nursing version: apply elastic to the top edge of the underlay, stretching elastic slightly as you sew. 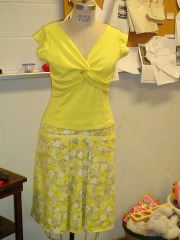 lay the upper bodice over the lower bodice, matching the underarm points. gather the ends of the ties as desired then baste sides together. hand tack the center of the underlay to the underside of the twist. the rest of the underlay top edge is left free. set in sleeves (or finish armholes). close side seams, catching the ends of the ties in the seam. hem. that's it! you'll be pleasantly surprised how quickly this top goes together. to nurse, all you do is lift the twist section and pull down the lower bodice (please forgive the close-up of my hand--there is only so much you can do when one hand is busy flashing your fancy nursing bra). 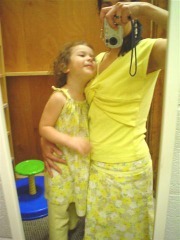 this outfit is actually part of a mommy/daughter set that i cut out last summer. i made ella's outfit the day after cutting it, but i didn't finish mine until about two weeks ago. this past weekend, ella stood up from the dinner table, held out her dress, and announced to everybody in the restaurant, "see my pretty dress? mama made it for me!" i could have cried with joy. 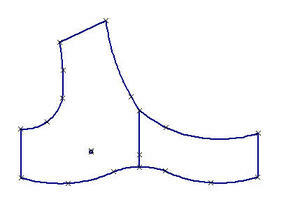 *all the pattern images in this post were created with the software i use to teach patternmaking at fashion design online.